One of the fasted growing camera markets today is in the continued growth of the small and lightweight adventure cameras, which provide video and still images of the activity from the photographer’s point of view (POV). These cameras gained popularity as a result of YouTube, as well as various social media platforms, where the photographers ‘adventure” could be posted and shared with others. As with all digital cameras, the continuing advancements in technology have resulted in the explosion in 360 cameras, which give a 360-degree view of the activity, making the perspective even more unique. While many thought these cameras were kind of a “fad”, they appear to be here to stay with many manufacturers now offering these cameras. Although we are only halfway thru 2017, let’s take a look at the top 360 cameras for 2017 and see what makes these cameras so popular! One of the latest cameras to hit the market is from Garmin, who is an established company with a long history in the “adventure” market as a leading GPS manufacturer. The Garmin VIRB 360 Action camera has many sought after features including 4K video, with a frame rate of 30 frames per second, as well as built in WIFI and GPS capabilities. Other features include an operating time and 360 audio capabilities. * Information from the Garmin website, including pricing. 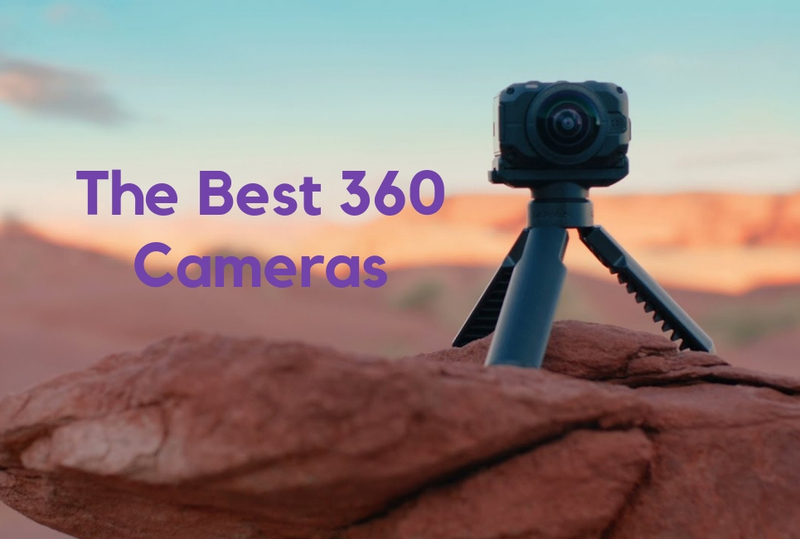 One of the initial manufacturers that developed 360 cameras is the firm 360Fly and their latest product is the 360fly 4k Video Camera and it offers a significant performance upgrade to their previous cameras. At the heart of the camera is 4K video, which captures excellent image quality at 50 frames per second. Other features include built in GPS, WIFI and image stabilization. The 360fly 4k offers a very powerful battery that provides an operating time of 1.5 hours of continuous shooting, as well as 360 audio and internal storage of up to 64 GB of video and still images. Lightweight at 172 grams, the 61mm sphere remains very popular because of its performance, as well it’s relatively low cost of $499.00, check out the latest prices here. * Information from the 360fly website, including pricing. A relatively new manufacturer of 360 action cameras is the electronic powerhouse Samsung. Their Gear 360 camera is jammed with premium features including 4K video, which captures excellent image quality at 24 frames per second. Although the camera does not have built in GPS, it does have WIFI and integrates well with Samsung’s numerous Smartphones, which makes sharing videos quick and easy. The camera also has a long battery life, allowing up to 130 minutes of continuous recording. Relatively small and lightweight the camera measures 100.6mm x 46.3mm x 45.1mm and weighs 130 grams. Unlike other 360 cameras, the Samsung offers a number of views other than 360, including stretched view, round view, dual view and panoramic view! The camera has a suggested retail price of $319.00, which is a great value for a camera with these features. Check out the latest prices here. Why Is It So Good 360 View, Stretched View, Round View, Dual View, Panoramic View; Integration With Samsung Smartphones. * Information from Samsung’s website, including pricing. The next camera on the list of best 360 cameras for 2017 is the Ricoh Theta S Spherical camera, which is a unique camera as it is more than a 360 camera, offering a wide variety of still and standard video capabilities. Although the camera only shoots in full HD at 30 frames per second, the video quality is excellent. Some of the other features of the Theta S include 8 GB of internal storage, as well as an operating time of up the 175 minutes depending upon the size of the video shoot. Photographers can also shoot and post video “live” via a Smartphone. One of the best features of the Theta S is its size, which measures 44mm x 13mm x 22.9mm and feels great to handle with the camera’s controls being conveniently located. Since the camera does not feature in cameras “stitching” 360 video is produced in postproduction on the photographer’s computer. At a suggested retail price of $349.95, the Theta S is substantially more than a 360 video camera. Check out the latest discounts and prices here. * Information from Ricoh’s website, including pricing. While by far the most expensive of the 360 cameras is the GoPro Omni, which has a suggested retail price of $4,999.99. it is also the one of the most unique cameras as it uses 6 GoPro Hero 4 cameras in an aluminum housing to capture video with a resolution of 8K! The software in the system synchronizes all six cameras to give the ultimate 360 and virtual reality experience. The video is captured at a frame rate of 60 frames per second, with the system’s batteries providing up to 2 hours of recording time per charge. In addition to being heavy at 914 grams, the system is also large measuring 120mm x 120mm and is in the shape of a cube. The camera relies on a specialized software package, which is downloaded onto the photographer’s computer to “stitch” the images together and do any editing of the content. While expensive, the GoPro Omni provides the ultimate 360 experience from the camera manufacturer that started the “adventure” video camera! * Information from GoPro’s website, including pricing. Although it is only half way through 2017, consumers have access to many great 360 cameras already this year and without a doubt, many more will be introduced before the end of the year. While many thought that 360 cameras were a novelty, they appear to be here to stay given their increasing popularity. Take a look at one of these cameras and put a completely new perspective on your photography, especially if you participate in “adventure” type of sports and activities. You will not regret it!